There’s something about summer that makes me want to make some cool jewelry. I’ve been drooling over those cool statement necklaces you see everywhere, but I just couldn’t get myself to spend the money on a trendy necklace…I tend to invest in classic pieces. 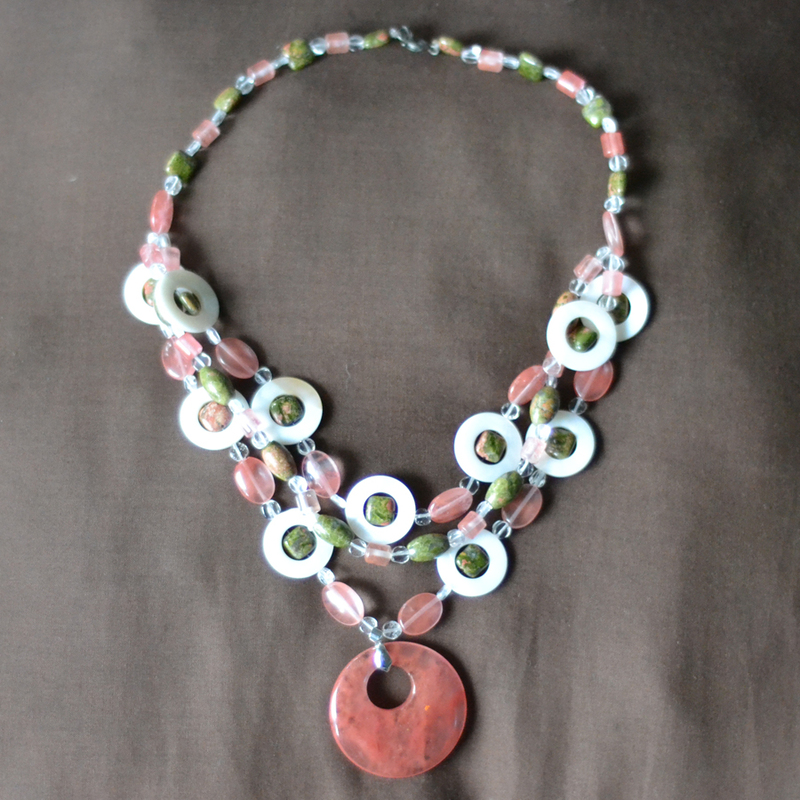 But just like last year, when I made my beachy coral necklace, when I went to the beach I had to go into the bead store. There must be something about the summer time and coral, because I gravitated to these coral glass beads, and these coral and green semi-precious stones—I think they are called unakite. So I decided to make another statement necklace, but because I am a more ambitious crafter than last year, I added more detail, more strands…and a large pendant in the middle of it all. I took the coral colored glass beads, 2 different sizes of unakite beads, some clear beads, and these fun beads that I’ve had for years that look like white washers. I had some fine invisible beading thread, too. I figured out a couple of different patterns for the 3 strands. Once I got them to the length I wanted, I ran all three strands into a single bead, and then threaded the rest of the necklace with the thread from all three strands on each side of the “bib”. I finished off with some hardware, and then tried it on—perfect. I have to admit, though, not everyone was as excited as I was about this necklace. My brother-in-law described it as “Ariel meets Mr T” and keep saying stuff like, “Pity the fool” all evening long. But I pity the fool that hates on my necklace because I am really enjoying it! Sometimes I link up at the following places: 504 Main, A Diamond in the Stuff, Alderberry Hill, At the Picket Fence, Beyond the Picket Fence, Cherished Bliss, Classy Clutter, C.R.A.F.T., Craft-o-maniac, Crafty Scrappy Happy, DIY Showoff, Eat at Home, Finding Fabulous, Gingersnap Crafts, Glued to My Crafts, Home Stories A to Z, House of Hepworths, House of Rose, I Heart Naptime, Lil Luna, Live Laugh Rowe, Made in a Day, My Favorite Finds, Not Just a Housewife, One Creative Mommy, Organizing Junkie, Semi Homemade Mom, Serenity Now, Simply Sugar and Gluten Free, Six Sisters Stuff, Skip to My Lou, So You Think You're Crafty, Someday Crafts, Sugarbee Crafts, Tatertots & Jello, The 36th Avenue, The Frugal Girls, The Grant Life, The Shabby Nest, Tidy Mom, Today's Creative Blog, Uncommon Designs, and Under the Table and Dreaming.